Takeaway: As a professional, ladder safety is part of your job. Most people don't think of ladders as an especially dangerous tool, and they're likely to climb it without stopping to wonder whether it's safe to do so. But there are some real risks associated with ladder use that shouldn't be overlooked. Using an unsafe ladder, or using it improperly, can result in a fall that causes serious injury or death. In this article, we'll look at what both employers and their employees need to do to ensure ladders are being used safely. The employer is responsible for setting up a safe work environment by providing the right equipment to do the job. The first task for the employer is to assess each job for work being done that cannot be reached safely from ground level. If there is work to be done at height, the next thing is to determine the length of time the employee will be required to remain at that height to perform the work. If the employee is simply using the ladder as a means to go up and down between work locations, as with roofers, then the time spent on the ladder per trip is minimal even though the work at either end will take more time. If the work requires an employee to remain at height for more than 30 minutes, then the employer should be looking at a safer alternative like a scaffold, lift, or other piece of equipment. If the work takes less than 30 minutes, then a ladder may be the right piece of equipment as long as there is an area where it can be placed so that it will remain level and stable. Ideally, there should be a way to secure the ladder. Finally, it is the responsibility of the employer to make sure that their workers are properly trained in safe ladder use (see Transient Workers vs Temporary Workers: Know Your Training Obligations for a related discussion). If you're asked to use a ladder as part of your job, your first duty is to make sure that you've received the proper training and are confident that you know how to be safe when using it. If you've worked with a ladder at a previous job, you might still need to get the training again. 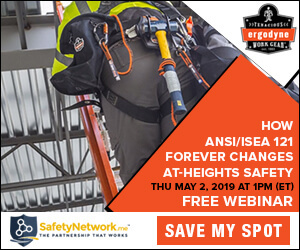 Not only is it a good idea to get refresher training to make sure you keep everything you need to know in mind, but safety rules governing ladder use are different across industries (if you're not getting the training you need, find out How to Refuse Unsafe Work). Don’t just assume that once you have put your ladder in place and make sure it's safe that it will stay that way throughout the entire day. Someone could have moved it slightly, which could render it unsafe without you realizing it. Before going up any ladder, give it a quick test by putting your weight on the bottom rung and trying to shift it left and right using your hands. On that note, you also need to know what the weight specs are on the ladder you are using. You may need to carry equipment and materials up and down the ladder and you need to take the weight of these along with your own weight into account. The rest of the rules do sound like common sense, but you only need to spend a few minutes on YouTube to see how many people ignore them with unhappy results (and definitely don't do any crazy stuff like this). Most of us have used a ladder at some point in our lives. That can make them seem familiar and safe, but it doesn't make us safety experts. I found that out the hard way when my body weight pushed the ladder into soft spring ground, which spilled me onto the ground and wounded both my pride and my backside. As a professional, ladder safety is part of your job. Making sure you meet your responsibilities when it comes to ladder safety either as an employer or employee can prevent some potentially serious consequences. YouTube is full of videos of people taking a stupid fall that will either make you shake your head or laugh. But he videos of people taking a serious or fatal fall don't turn up online – they end up in the courts.